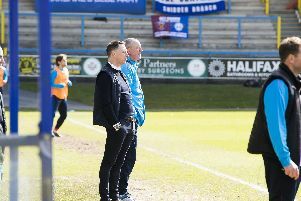 FC Halifax Town boss Billy Heath says the club have appealed the red-card shown to Richard Peniket in their 6-2 win over Tamworth last Saturday. The Shaymen are expected to find out tomorrow if the appeal has been successful, with Heath “hopeful” that the decision may be overturned. The Town striker was sent-off for an alleged elbow on Tamworth’s Jack Lane, but the forward and manager Billy Heath were both adamant the decision by referee Steve Copeland was incorrect. If the appeal is successful, Peniket will be eligible for Saturday’s home game with Salford. If not, he will be suspended for Halifax’s next three games.